Spring is finally here in the Pacific Northwest. Not just 70+degree weather, but beautiful spring vegetables as well. Everything is brighter, the grass, the flowers, and the food! I can't control myself, all of this awesome weather, just makes me happy. I guess it doesn't matter how warm the weather is getting, I'm still a soup girl. But the type of soup gradually changes per season. Thick, hearty soups during the fall time. Stews for the winter, and now, simple with fresh-ingredients soup that is served warm, not hot. Vibrant, bright green colors swirled with cream and topped off with olive oil. Now that is a soup! This recipe is heavy on the leek, green onion side. If that isn't your thing. Replace the green onions with a zucchini. Or toss in some handfuls of basil. Anything green works basically. In a large saucepan, heat the olive oil over medium heat. Add the chopped leeks and cook, stirring occasionally, for 5-7 minutes, until softened. Add the chicken stock and bring to a simmer. Stir in the chopped green onions, watercress and parsley, and cook for another 5-7 minutes. Season with salt and freshly ground pepper. Taste the broth and re-season if needed. 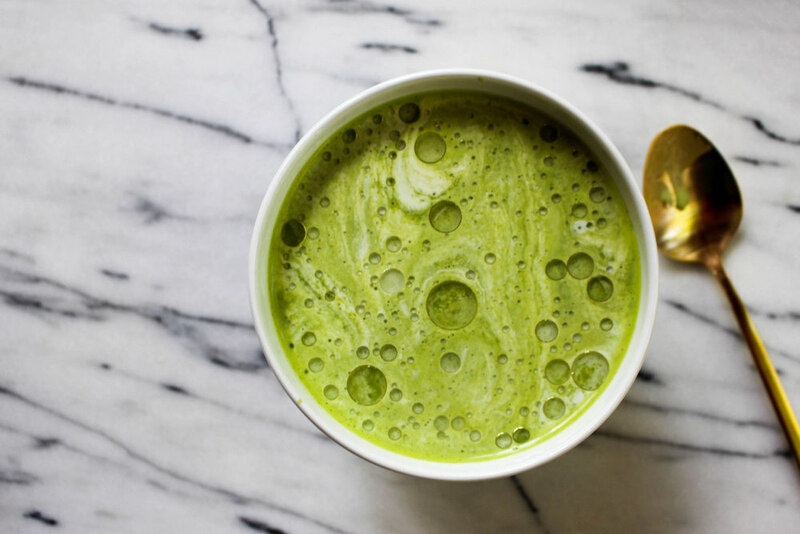 Using a blender or food processor, blend the solids, leaving the broth in the pan. Add 1/2 cup of stock at a time, blend, taste and add more stock if needed. Blend until creamy. Using a fine mesh strainer placed over the pan, pour the mixture over top and using the back of a spoon, push the soup through the strainer. Rewarm the soup before serving. Ladle the soup into bowls, swirl in 1 tablespoon of heavy cream per bowl. Top with a drizzle of olive oil and a few grinds of fresh pepper.